Bigger camera, no antenna strips on the backside, no headphone jack - these are some of the rumors that have long been circulating on the web for iPhone 7. A YouTube video shows us the redesigned Apple smartphone compared with its predecessor iPhone 6S. A video has surfaced in Chinese short message service Weibo, in which a user, compares the iPhone 7 with the predecessor iPhone 6S. 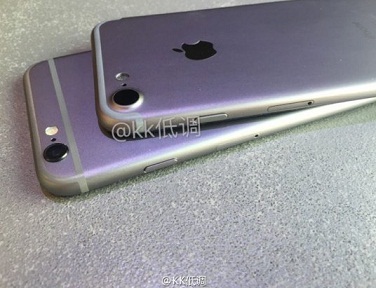 Thereby, the clip confirmed rumors of a new design of the Apple smartphone. Thus, the alleged iPhone 7 in the video shows no antenna strip on the back. It moved to the edge. The orientation also falls significantly larger than its predecessor. However, a mute button is still included. Recently, there had been rumors that Apple will remove the key on the iPhone 7. This is not the first video clip featuring iPhone 7 appears on the web. Recently a seven seconds long clip had surfaced. It fueled rumors that the new Apple smartphone will be released without a classic headphone jack. It has also confirmed by the new clip. The iPhone 7 in the video does not have a headphone jack. Instead, a second speaker can be found at the bottom. It is unclear whether the iPhone 7 appears in the video is real. However, it can be seen in the clip that it is not an executable prototype, but a non-functioning dummy. The smartphone is not responding to the user's input. Probably it is a dummy, which is used by an accessories manufacturer to test cases.